Great for tailgating, camping, or barbecuing from day into night, the Igloo Party Bar features the LiddUp LED light system—16 water-resistant, heat-free lights that illuminate the cooler’s contents when darkness falls—letting thirsty guests find what they want quickly. 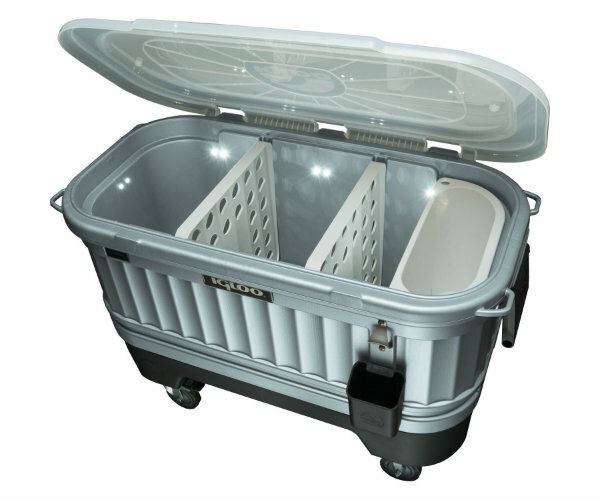 This large cooler anticipates your every merry-making need, from a removable lid and drink dividers to mobile-ready locking casters on a detachable base. Operates on four AA batteries (not included).